This list was last updated on July 17, 2017. The link above was updated on December 26, 2018. Pressure calculator with Gay-Lussac Pressure Law and Viking 2 results. Prediction success totals per time-bin and corresponding % of successful predictions. Except for Sol 370 the black MSL pressure curve is suspiciously too close to the Viking 2 curve above it and the Viking 1 curve below it. REMS also alters pressures for Sols 1160 and 1161. REMS again revises pressures for Sols 1300 and 1301. REMS alters temperature data too when it is off the curve. VL-1 pressures of .26 to .3 time-bins & .3 and .34 time-bins. Sols 134 -199. VL-1 pressures of .26 to .3 time-bins & .3 and .34 time-bins. Sols 200-219. VL-2 pressures of .26 to .3 time-bins & .3 and .34 time-bins. Sols 176-199. VL-2 pressures of .26 to .3 time-bins & .3 and .34 time-bins. Sols 201-260. VL-2 pressures of .26 to .3 time-bins & .3 and .34 time-bins. Sols 261-290. VL-2 pressures of .26 to .3 time-bins & .3 and .34 time-bins. Sols 291- 305. Approximate display of how MSL pressure data fits in with VL-2, VL-1 and Phoenix data. Pressure curve for MSL’s first 866 sols. Dust Storms and pressures recorded at Vikings 1 and 2. Dust Storm at Luke Air Forces Base, July 5, 2011. Opacity changes at Opportunity from sols 1205 to 1235. Methane spikes seen by MSL at Gale Crater. Sols 1720 to 1721 – Record low of -136° C.
MSL Sols 1717 to 1721 topography with altitudes below areoid with low air and ground temperatures posted by the REMS Team. Figure 64A - JPL identified positions and MOLA altitudes for sols 1639 to 1671. Low air and ground temperatures were added based on REMS Team weather reports. More temperature detail is found on Figure 63B. Figure 64B – JPL published the positions for MSL Sols 1635, 1636, 1639, 1642, 1643, 1645, 1646, 1648 and 1649. 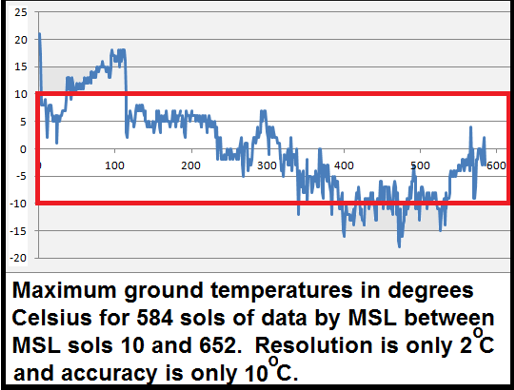 During these dates low ground temperatures varied between -79° and -93° C. However, the dates that they did not show had ground temperature lows that varied from -80° and -111° C with five temperatures colder than -101° C, the coldest temperature ever observed by MSL. At Sols 1647 to 1648 Curiosity was at an altitude of 4,300 meters below areoid. At Sol 1.635 (upper left) Curosity was at 4,304 meters below areoid. Alteration of REMS Team report for Sol 1605 after we questioned it.